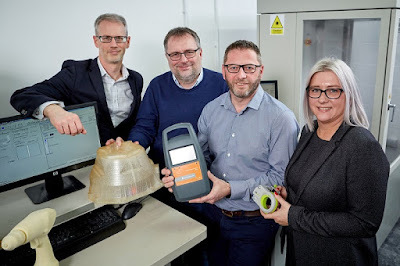 AME Group, a leading prototype manufacturer that is based in Dinnington, Rotherham, is set to create new jobs having secured a £100,000 loan. Now based on the site of the former Dinnington Colliery, AME has secured the funding from NPIF – Mercia Debt Finance, which is managed by Mercia Fund Managers and is part of the Northern Powerhouse Investment Fund (NPIF). Based at the British Business Bank in Sheffield, the £400m NPIF works with ten Local Enterprise Partnerships (LEPs), combined authorities and Growth Hubs, as well as local accountants, fund managers and banks, to provide a mixture of debt and equity capital to northern-based SMEs at all stages of their development. NPIF is providing funding to fund managers who will offer Microfinance, Business Loans and Equity Finance. AME now employs over 20 staff and has a turnover of around £1.5m. It is one of a few firms of its type outside London with a blue-chip client base and the company also offers in-house rapid prototyping using the latest 3D print technology. The company now plans to strengthen its design team by creating multiple roles over the next 12 months. Pete Sorsby, investment manager at Mercia Fund Managers (pictured, left), said: "AME has built its business on the strength of its product design process and is regarded as one of the UK's leading and most innovative product design consultancies. The business has helped to bring creativity to the former colliery site and generate new jobs. This funding will help to support its growth and expand the team." Grant Peggie, director at British Business Bank, added: "SMEs like AME Group form the foundation of the region's future growth and we are pleased to be able to support these businesses by providing the growth finance required. We will continue to work with our fund managers and the wider business communityto support creative and innovative businesses across the Sheffield City Region." In 2016, AME secured a £20,000 business loan from Finance Yorkshire to enable the group to expand its team and improve marketing. The company also put to use a £30,000 business loan from the regional funding body in 2013. Last year, the designers at AME won a prestigious Red Dot product design award for their work on JigTech Pro, an innovative device that enables door handles to be fitted in minutes.